I have been on a shorts kick lately. Like, I’ve just been drawn to them for no good reason at all except that they look cute. Well, that’s reason enough. I’ve been specifically paying attention to the cut. Some shorts, especially when we’re talking about fast fashion (H&M, Nasty Gal, Zara, etc. ), can look absolutely horrid on the leg. HORRID. Well, that wasn’t the case for these Nasty Gal It’s A Trip Shorts. The tulip overlay merged with the scalloped lace trim performs a little elongating magic on the leg that makes them a must have for the summer. Don’t judge me if I wear these everyday, ok? One last thing, we’re approaching the last few days of the Vanity Fair International Best Dressed Challenge. So, if you have a little extra time, check out the profile for the The Werk! Place here and show a little love. Shirt: H&M, Belt: BCBG, Shorts: Nasty Gal, Necklaces: Tiffany & Co.
Buying shorts because their cute is a great and logical reason. These shorts are so cute and cool. Love how you styled it with the striped shirt, it makes it look like a romper. 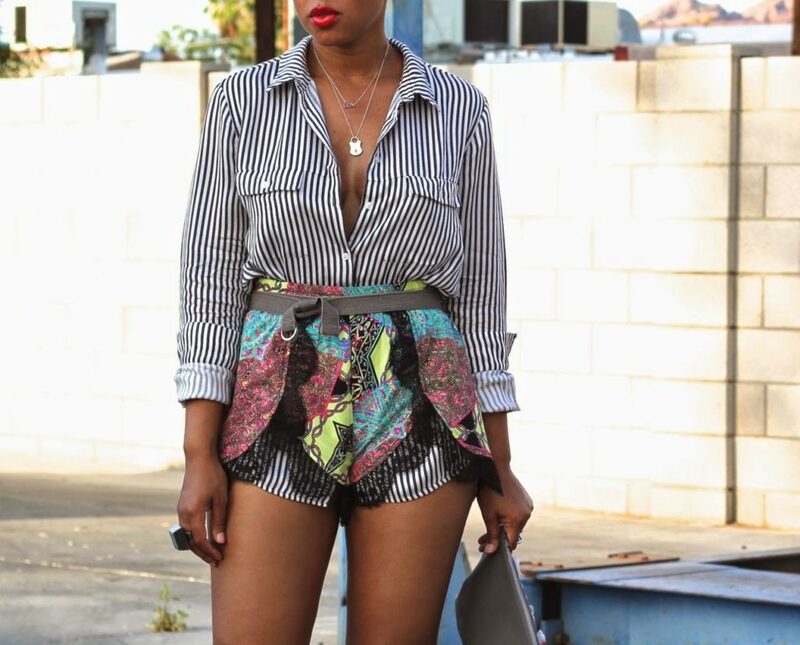 I love how you styled these shorts! You look stunning as always!! Love this look. Nice! Cool how you pulled the shirttail through! Tied them together, at first glance gives the illusion of a one piece! cute look all around! Love the intricate pattern on the shorts! So stylish! I love the clutch! May I ask how is sizing? Than you.